"VHF" redirects here. For the diseases, see Viral hemorrhagic fever. Very high frequency (VHF) is the ITU designation for the range of radio frequency electromagnetic waves (radio waves) from 30 to 300 megahertz (MHz), with corresponding wavelengths of ten meters to one meter. Frequencies immediately below VHF are denoted high frequency (HF), and the next higher frequencies are known as ultra high frequency (UHF). Common uses for radio waves in the VHF band are FM radio broadcasting, television broadcasting, two way land mobile radio systems (emergency, business, private use and military), long range data communication up to several tens of kilometers with radio modems, amateur radio, and marine communications. Air traffic control communications and air navigation systems (e.g. VOR & ILS) work at distances of 100 kilometres (62 mi) or more to aircraft at cruising altitude. In the Americas and many other parts of the world, VHF Band I was used for the transmission of analog television. As part of the worldwide transition to digital terrestrial television most countries require broadcasters to air television in the VHF range using digital rather than analog format. Radio waves in the VHF band propagate mainly by line-of-sight and ground-bounce paths; unlike in the HF band there is only some reflection at lower frequencies from the ionosphere (skywave propagation). They do not follow the contour of the Earth as ground waves and so are blocked by hills and mountains, although because they are weakly refracted (bent) by the atmosphere they can travel somewhat beyond the visual horizon out to about 160 km (100 miles). They can penetrate building walls and be received indoors, although in urban areas reflections from buildings cause multipath propagation, which can interfere with television reception. Atmospheric radio noise and interference (RFI) from electrical equipment is less of a problem in the band than at lower frequencies. The VHF band is the first band at which efficient transmitting antennas are small enough that they can be mounted on vehicles and portable devices, so the band is used for two-way land mobile radio systems, such as walkie-talkies, and two way radio communication with aircraft (Airband) and ships (marine radio). Occasionally, when conditions are right, VHF waves can travel long distances by tropospheric ducting due to refraction by temperature gradients in the atmosphere. For analog TV, VHF transmission range is a function of transmitter power, receiver sensitivity, and distance to the horizon, since VHF signals propagate under normal conditions as a near line-of-sight phenomenon. The distance to the radio horizon is slightly extended over the geometric line of sight to the horizon, as radio waves are weakly bent back toward the Earth by the atmosphere. is the height of the antenna in meters. These approximations are only valid for antennas at heights that are small compared to the radius of the Earth. They may not necessarily be accurate in mountainous areas, since the landscape may not be transparent enough for radio waves. In engineered communications systems, more complex calculations are required to assess the probable coverage area of a proposed transmitter station. The accuracy of these calculations for digital TV signals is being debated. VHF is the first band at which wavelengths are small enough that efficient transmitting antennas are short enough to mount on vehicles and handheld devices, a quarter wave whip antenna at VHF frequencies is 25 cm to 2.5 meter (10 inches to 8 feet) long. So the VHF and UHF wavelengths are used for two-way radios in vehicles, aircraft, and handheld transceivers and walkie-talkies. Portable radios usually use whips or rubber ducky antennas, while base stations usually use larger fiberglass whips or collinear arrays of vertical dipoles. For directional antennas, the Yagi antenna is the most widely used as a high gain or "beam" antenna. For television reception, the Yagi is used, as well as the log-periodic antenna due to its wider bandwidth. Helical and turnstile antennas are used for satellite communication since they employ circular polarization. For even higher gain, multiple Yagis or helicals can be mounted together to make array antennas. 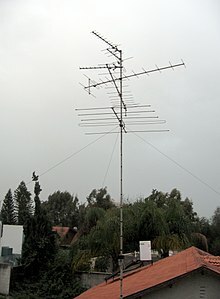 Vertical collinear arrays of dipoles can be used to make high gain omnidirectional antennas, in which more of the antenna's power is radiated in horizontal directions. Television and FM broadcasting stations use collinear arrays of specialized dipole antennas such as batwing antennas. Certain subparts of the VHF band have the same use around the world. Some national uses are detailed below. 50–54 MHz: Amateur Radio 6-meter band. 108–118 MHz: Air navigation beacons VOR and Instrument Landing System localizer. 144–148 MHz: Amateur Radio 2-meter band. A plan showing VHF use in television, FM radio, amateur radio, marine radio and aviation. The VHF TV band in Australia was originally allocated channels 1 to 10-with channels 2, 7 and 9 assigned for the initial services in Sydney and Melbourne, and later the same channels were assigned in Brisbane, Adelaide and Perth. Other capital cities and regional areas used a combination of these and other frequencies as available. The initial commercial services in Hobart and Darwin were respectively allocated channels 6 and 8 rather than 7 or 9. By the early 1960s it became apparent that the 10 VHF channels were insufficient to support the growth of television services. This was rectified by the addition of three additional frequencies-channels 0, 5A and 11. Older television sets using rotary dial tuners required adjustment to receive these new channels. Most TVs of that era were not equipped to receive these broadcasts, and so were modified at the owners' expense to be able to tune into these bands; otherwise the owner had to buy a new TV. Several TV stations were allocated to VHF channels 3, 4 and 5, which were within the FM radio bands although not yet used for that purpose. A couple of notable examples were NBN-3 Newcastle, WIN-4 Wollongong and ABC Newcastle on channel 5. While some Channel 5 stations were moved to 5A in the 1970s and 80s, beginning in the 1990s, the Australian Broadcasting Authority began a process to move these stations to UHF bands to free up valuable VHF spectrum for its original purpose of FM radio. In addition, by 1985 the federal government decided new TV stations are to be broadcast on the UHF band. Two new VHF, 9A and 12, have since been made available and are being used primarily for digital services (e.g. ABC in capital cities) but also for some new analogue services in regional areas. Because channel 9A is not used for television services in or near Sydney, Melbourne, Brisbane, Adelaide or Perth, digital radio in those cities are broadcast on DAB frequencies blocks 9A, 9B and 9C. VHF radio is also used for marine Radio  as per its long-distance reachability comparing UHF frequencies. Until 2013, the four main Free-to-Air TV stations in New Zealand used the VHF Television bands (Band I and Band III) to transmit to New Zealand households. Other stations, including a variety of pay and regional free-to-air stations, were forced to broadcast in the UHF band, since the VHF band had been very overloaded with four stations sharing a very small frequency band, which was so overcrowded that one or more channels would not be available in some smaller towns. However, at the end of 2013, all television channels stopped broadcasting on the VHF bands. Refer to Australasian television frequencies for more information. British television originally used VHF band I and band III. Television on VHF was in black and white with 405-line format (although there were experiments with all three colour systems-NTSC, PAL, and SECAM-adapted for the 405-line system in the late 1950s and early 60s). British colour television was broadcast on UHF (channels 21-69), beginning in the late 1960s. From then on, TV was broadcast on both VHF and UHF (VHF being a monochromatic downconversion from the 625-line colour signal), with the exception of BBC2 (which had always broadcast solely on UHF). The last British VHF TV transmitters closed down on January 3, 1985. VHF band III is now used in the UK for digital audio broadcasting, and VHF band II is used for FM radio, as it is in most of the world. Unusually, the UK has an amateur radio allocation at 4 metres, 70-70.5 MHz. 43–50 MHz: Cordless telephones, 49 MHz FM walkie-talkies and radio controlled toys, and mixed 2-way mobile communication. The FM broadcast band originally operated here (42–50 MHz) before it was moved to 88–108 MHz. 50.800–51 MHz: Radio-controlled aircraft (on ten fixed frequencies at 20 kHz spacing) with an FCC Amateur Radio Service license, flown under FCC Part 97, rule 97.215. 72–76 MHz: Radio controlled models, industrial remote control, and other devices. Model aircraft operate on 72 MHz while surface models operate on 75 MHz in the US and Canada, air navigation beacons 74.8–75.2 MHz. 156–158 MHz VHF Marine Radio; 156.8 MHz (Channel 16) is the maritime emergency and contact frequency. 159.81-161.565 MHz railways [b] 159.81–160.2 are railroads in Canada only and is used by trucking companies in the U.S.
174–216 MHz television channels 7–13 (VHF-Hi), known as "Band III" internationally. A number of DTV channels have begun broadcasting here, especially many of the stations which were assigned to these channels for previous analog operation. Cable television, though not transmitted aerially, uses a spectrum of frequencies overlapping VHF. The U.S. FCC allocated television broadcasting to a channelized roster as early as 1938 with 19 channels. That changed three more times: in 1940 when Channel 19 was deleted and several channels changed frequencies, then in 1946 with television going from 18 channels to 13 channels, again with different frequencies, and finally in 1948 with the removal of Channel 1 (analog channels 2-13 remain as they were). 87.5–87.9 MHz is a radio frequency which, in most of the world, is used for FM broadcasting. In North America, however, this bandwidth is allocated to VHF television channel 6 (82–88 MHz). The analog audio for TV channel 6 is broadcast at 87.75 MHz (adjustable down to 87.74). Several stations, most notably those joining the Pulse 87 franchise, have operated on this frequency as radio stations, though they use television licenses. As a result, FM radio receivers such as those found in automobiles which are designed to tune into this frequency range could receive the audio for analog-mode programming on the local TV channel 6 while in North America. The FM broadcast channel at 87.9 MHz is normally off-limits for FM audio broadcasting; it is reserved for displaced class D stations which have no other frequencies in the normal 88.1–107.9 MHz subband to move to. So far, only two stations have qualified to operate on 87.9 MHz: 10 Watt KSFH in Mountain View, California and 34 Watt translator K200AA in Sun Valley, Nevada. In some countries, particularly the United States and Canada, limited low-power license-free operation is available in the FM broadcast band for purposes such as micro-broadcasting and sending output from CD or digital media players to radios without auxiliary-in jacks, though this is illegal in some other countries. This practice was legalised in the United Kingdom on 8 December 2006. ^ The 42 MHz Segment is still in current use by the California Highway Patrol, New Jersey State Police, Tennessee Highway Patrol, and other state law enforcement agencies. ^ The 160 and 161 areas are Association of American Railroads (AAR) 99 channel railroad radios, issued to the railroad. For example, AAR 21 is 160.425 MHz and that is issued to Tennessee Valley Railroad Museum, as well as other railroads that want AAR Channel 21. ^ Seybold, John S. (2005). Introduction to RF Propagation. John Wiley and Sons. pp. 9–10. ISBN 978-0471743682. ^ "Marine VHF radio". ACMA. ^ "Australian radiofrequency spectrum plan". Planning. ACMA. ^ "Going Digital - When is my area going digital?". goingdigital.co.nz. Ministry for Culture and Heritage. Archived from the original on 17 October 2011. Retrieved 20 October 2011. ^ a b Canadian Table of Frequency Allocations 9 kHz – 275 GHz (2005 (revised February 2007) ed.). Industry Canada. February 2007. pp. 29–30. ^ "Cable TV Channel Frequencies". www.jneuhaus.com. Archived from the original on 23 August 2017. Retrieved 27 April 2018. ^ "What Ever Happened to Channel 1?". tech-notes.tv. Tech Notes. Table 1. Archived from the original on 17 March 2017. Retrieved 27 April 2018. ^ "Change to the law to allow the use of low power FM transmitters for MP3 players". Ofcom. 23 November 2006. Archived from the original on 7 August 2011. Retrieved 2 October 2012.